Heat the olive oil over medium in a large pan. I was very happy using my cast iron skillet for this recipe, even though I had to eventually top it with a wok lid. Sprinkle both sides of the chicken thighs with salt and pepper. 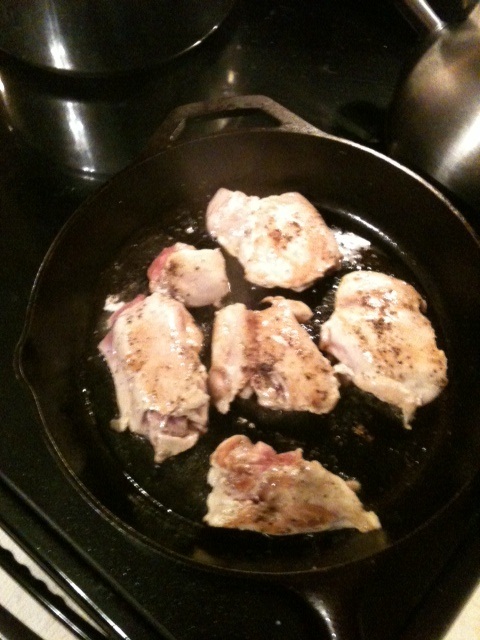 When the oil is hot, place the chicken in the pan, browning on both sides, 3-4 minutes per side. The longer you cook in this step, the faster the chicken will cook in the sauce, so if you’re short on time, you can make it up here. Remove cooked chicken to a plate. Meanwhile, in the oil left in the pan (you may need to add a bit more), add chopped onion. 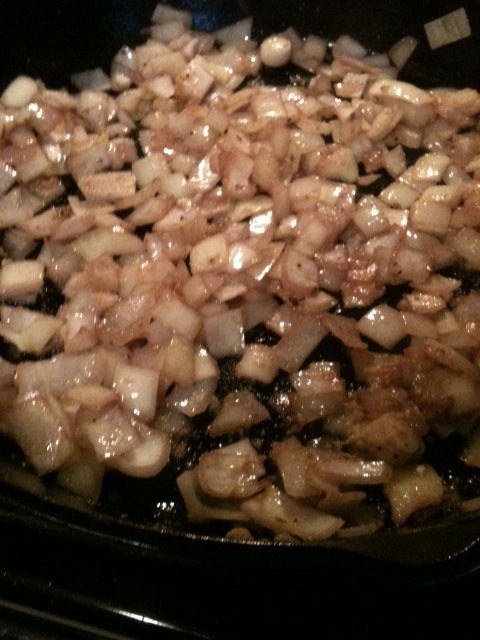 Saute 4-5 minutes, until onion is translucent. Add garlic and cook 1-2 minutes more, until fragrant. At this point, I dumped a bit of my glass of wine into the pan to deglaze it, which worked out nicely. Not necessary, though, or you could get fancy and pour a bit out of a bottle instead of your glass like a hoosier. Do what you like. I am not here to judge. 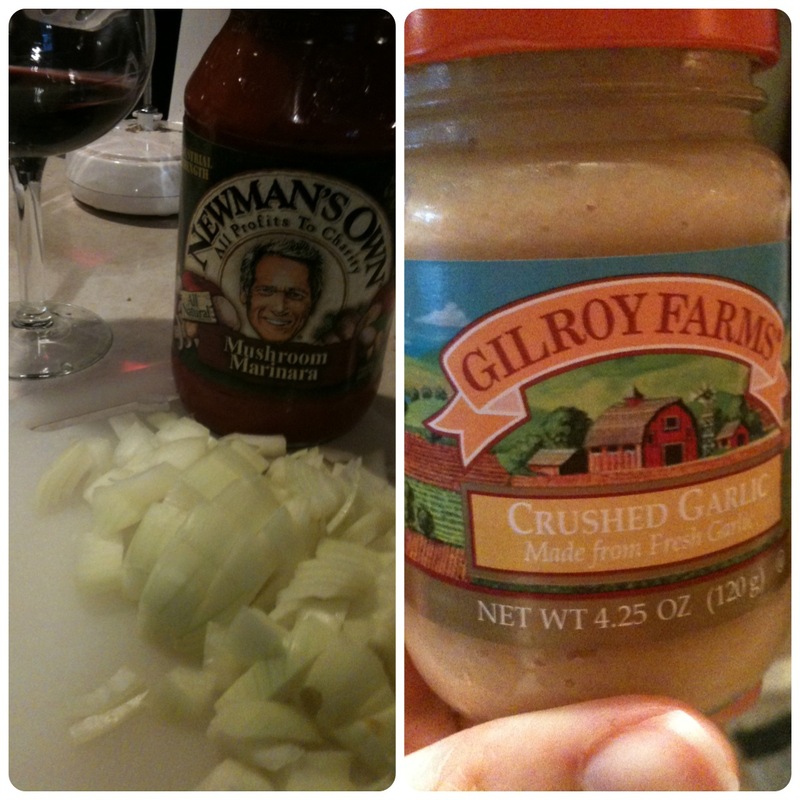 Add chicken back to the pan and pour in marinara sauce (I used Newman’s Own Mushroom Marinara. Oh Paul, stop making eyes at me, you handsome devil, you). I didn’t cover the chicken thighs, just poured the sauce around them. The Pioneer Woman recipe actually slow cooks this for hours, creating a shredded chicken ragu of sorts, but I wanted whole chicken to serve over pasta. Bring this mixture to a light boil (be careful of splatters or use a splatter guard), then reduce heat to medium low and cook for 25 minutes. In the meantime, cook pasta or rice and set aside. When the chicken is cooked through, pour yourself another glass of wine, serve chicken and sauce over pasta, and enjoy. 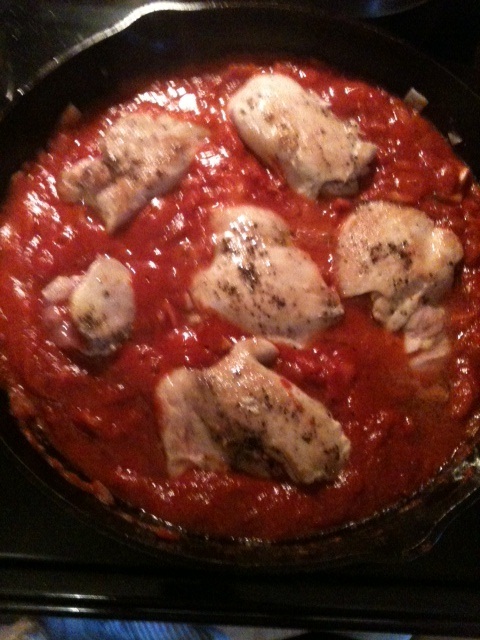 This entry was posted in Chicken, Classics, Dinner, Easy, Fast, Gluten free, One Pot, Pasta and tagged braised chicken thighs, chicken, chicken thighs, chicken thighs in marinara, pasta. Bookmark the permalink.